Twinkle Tots dance classes are perfect for children aged 18 months to 3 years. Have great fun dancing with your favourite grown-up! Bring your teddy or dolly and join in with Giselle and George, the Giselle Academy Twin dolls, to start your dance training early. This delightful dance class is specifically aimed at pre-school children aged 3 – 4 years. Using fun and imagery to teach the first steps of ballet and tap. 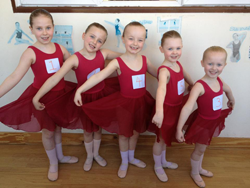 After practising their basic tap steps, the children put on their ballet shoes and using their own doll or teddy, percussion instrument and/or floaty scarf they enjoy classical ballet through nursery rhymes, imagination and enthusiasm. This ‘next steps’ ballet and tap class follows the pre-school class (although it does not matter if you have not been to the pre-school class) and is aimed at children aged 5 – 6. Here the children learn their ‘shuffles’ and ‘plies’ in a friendly, gentle environment where they will follow an imaginative and creative syllabus leading to their first examinations.